Expectations are often the problem, rather than a bad film, when you go to the cinema a lot, like I do. And many a time I have drifted out of Screen 1 at the Renoir disappointed that a favourite boutique arthouse director had not lived up to his previous work. The problem being that their previous work I probably went to with no expectations at all and was pleasantly surprised. Pleasant surprise has the habit of becoming awestruck respect, and in some cases films which you “discovered” are hugely over-rated. And thus their poor, but not significantly poor successors end up in this list because the expectation outweighed that of what any film could seriously provide. I have been torn about my number two for this reason. 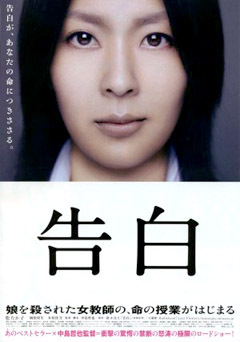 Confessions was a film I had a strong reaction against, but was it because I had seen Tetsuya Nakashima two previous films in the two previous weeks on DVD. Both Memories Of Matsuko and Kamikaze Girls had pulled me out of a long standing funk about the paucity of decent recent Japanese films. Pop savvy but fun, moving about the human stories tied into our newer archetypes. Sharp, with strong female leads and stories I hadn’t seen before told in a way I hadn’t seen before. And so I was really rather excited to see Confessions at the ICA, a dark high school tale exposing the pressure of Japanese public schools and the cruelty children to their peers. 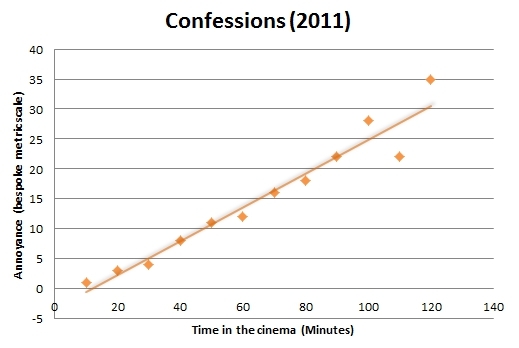 Here is a graph of my reaction to Confessions as I watched it. My dislike building arithmetically to an uncomfortable boiling point near the end. I hated it. And such a visceral reaction came out of me from almost the first twenty minutes. The visual flair from the previous movies had been tamed, the story was not only offensively over the top it also made little sense and was so bizarre that it couldn’t work as a commentary, satire or – well – anything. And yet when I came out, the only thing that could adequately describe my dislike of the film was to say it has Radiohead on the soundtrack. Proper 90’s, mopey, film soundtrack of the disenfranchised teen Radiohead. You know, the Radiohead that Radiohead are embarrassed of. Its quite possible that the ubiquity of Radiohead in film soundtracks fifteen years ago, in films like this, has soured me on them forever. But what it has soured me on is the use of Radiohead as shorthand for the angsty teen. For the murderous evil teen depression which is all over Confessions like no teenage who ever existed. It’s a film which starts with a child who is infected with HIV, stabbing other kids with a needle contaminated with his own blood. And then gets darker, sillier and less relatable by the second. There are slow motion bombs, there are handwringing suicides and the tone is so portentous that you might be forgiven for thinking it’s a Public Service Announcement. When you finally discover what it is all about, who the real apparent mastermind of the beyond far fetched plot is, if you ever had any goodwill towards any part of the movie it gets torn to shreds. Confessions is a multi-layer revenge story where the dish is not only served cold, but served via clockwork robots made of brown paper and fairy breath. It is that ridiculous – whilst all the while pretending to be IMPORTANT. Confessions is based on a novel, and I cannot help but think, and want to think, that the problems with the film (the lousy characters, the ridiculous plot) are likely faults of the book. I want to think that because I want Nakashima to bounce back, go back to his previous films which delighted me so much. Because Confessions was toxic to me. There’s a supply and a demand component to that disappointment. If “pleasant surprise has the habit of becoming awestruck respect,” then from the director’s perspective, insouciant creativity has the habit of becoming unchecked confidence, which also leads to film #3, film #4 or so being disappointing. Cf. Wes Anderson. Hell, even P.T. Anderson. The trailer is so overwrought (in a vaguely Clockwork Orange-y way) that no one could ever be confident about going to/renting a film on that basis. I checked and Radiohead wasn’t on *that* many soundtracks in the mid ’90s (here’s the list), and only the *one* song *really* got overplayed (to the point where, as you effectively mention, even Radiohead gave it a rest for about a decade – note that imdb lists only one relatively obscure Radiohead track on the Confessions s/track; do they loop it in the film?). Lots of early Radiohead songs remain in my view among their best, and their exposing/slightly embarrassing qualities are key to their power. Thinking About You was one of Thom Yorke’s first songs, and I kind of wish he’d write with that kind of immediacy again. @1, Martin. Is the phenomenon you’re describing well captured by the idea of ‘diminishing returns’ on relatively fixed, highly patterned sensibilities (the Wes Anderson case for sure). i appear to like Wes Anderson’s third and fourth films the actual best — but (a) I’ve never seen his first and am not sure I ever saw his second*, and (b) Royal Tenenbaums is largely centred on someone identical to the very terrible dad of the person I saw it with, so she enjoyed it immeasurably, and on the whole what she likes I like. The Life Aquatic is also pretty much about her family. *I always thought I did but I now think I’m thinking of Election. I think Royal Tenenbaums is Wes Anderson’s best film, too – it’s certainly better than (the little-seen) Bottle Rocket, although it would be the classic hipster move to claim otherwise. From the extremity of Pete’s reaction to Confessions (which I haven’t seen), I suspect the problem can’t just be the play of low/high expectations, powerful as that is. Having read a couple of glowing reviews of people who loved it, and of course its success in the Japanese academy awards (winning best picture, director and screenplay), there is a good chance it is one of those films that thematically will rub me up the wrong way, compounded by a misuse of his otherwise excellent technique. Others see it as more of a horror film, which is a reading I find rather alien. It certainly fits in the tradition of Japanese films with a hatred of the young, which is theme I have never been able to warm to (satirically treated or not). Do Death Note 1&2 belong in this tradition? I watched them one afternoon with Martin S, and didn’t like them much — though he very much seemed to. I think so (though hatred was probably the wrong word, hatred borne of fear is more like it). The proper ’90s Radiohead song in it is actually from 2007! It worked OK for me because I hadn’t heard that specific song before. I loved all of the Boris stuff on the soundtrack which was new to me too. Also he had another film between Memories of Matsuko and this – Paco and the Magical Book, which is a completely bonkers fairytale thing partly in rubbish CGI and very difficult to track down an English-subtitled version of. @Iain F., 8. Yes, and it’s a great song (when I saw the song listed, I originally thought it was referring to a very Morricone-ish Radiohead fragment from ’90s bootlegs which used to be called ‘Last Flowers to the Hospital’). 13 Worst Films Of 2011: How Do You Know What Number 11 Will Be?